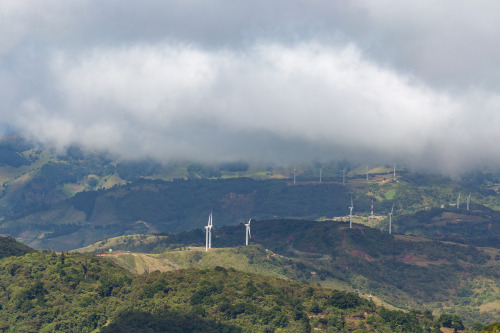 Wind farm in Costa Rica (image courtesy of Jiri Stoklaska via Shutterstock). According to preliminary data from the Costa Rican Electricity Institute (ICE), between January 1 and December 31, Costa Rica produced 10,778.32 gigawatt hours (GWh), of which 98.21% came from renewable sources, a percentage similar to that of 2015, when Reached 98.99%. The numbers stand out in two years with particular characteristics: 2015 was strongly affected by the El Niño phenomenon, while 2016 had low rainfall throughout the country during most of the year. The optimization of the medium and large storage reservoirs of the Costa Rican Institute of Electricity has been fundamental to maintain these percentages. After 17th June of last year fossil fuels were used just once for electricity generation. The biggest renewable contributor in 2016 was hydroelectric plants, which accounted for 74 of the country's total electricity needs. Following this, 12% of Costa Rica's energy needs were met by geothermal power, while wind accounted for 10%. ICE have stated their hopes for Costa Rica to reach carbon neutrality by 2021. The president of the company, Carlos Manuel Obregó, has said the institute expects renewable power generation to stay "stable" throughout 2017, with four new wind farms being introduced and a forecast of favorable hydro-meteorological conditions near the nation's hydropower plants.